Quote Reply Topic: Dutch meat "pudding"
This is a good video version of the recipe: http://cookit.e2bn.org/historycookbook/1513-dutch-pudding.html There are a number of interesting recipes linked here. This is one of my favorite recipes for my cast iron cauldron collection. I prefer to boil the cabbage for a few minuets to soften the outer leaves before peeling them back. I cut out the inner 2/3-3/4 of the cabbage to use in other dishes. I just cannot quite bring myself to use something as "healthy" as suet so I mix about 1/2 ground beef and half ground pork. 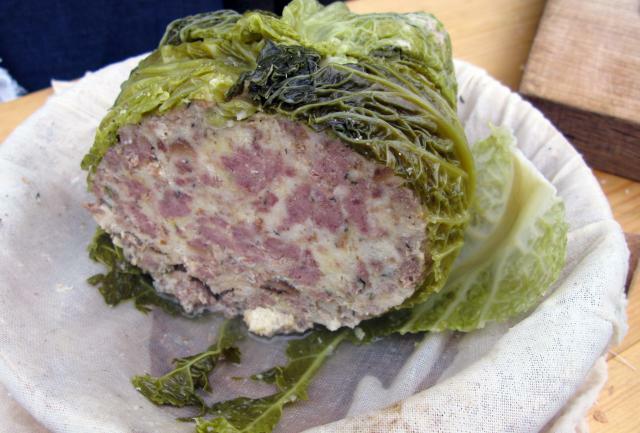 I use similar spices and also like to serve this with mustard but I form the big meat ball around a hard boiled egg before wrapping it in the softened cabbage leaves. The egg gives it a little more flavor and texture as well as making sure that there is no undercooked center. I like to simmer it most of the day at reenactments. say, karl - that looks great! i've seen similar-lookong dishes and would like to try one - will take a closer look at this! What a great, authentic recipe! Thanks for posting Karl...I may just give this one a shot in the Dutch oven before too long. Seems to be like a giant golabki. It is somewhere between a cabbage roll and a meatloaf. Does anyone happen to have similar stuffed vegetable recipes for boiling or not? There was a long gone restaurant in NC that served what they called zucchini port au prince which was stuffed with bread crumbs, cheese, and meat but my Google-fu has failed to find recipe. My father was a Chinese restaurant fan when he went to college in the late 40s and mentioned a stuffed cucumber that was apparently a common menu item in Philadelphia then but I have never seen. i've heard of several stuffed vegetables - including the zucchini ~ and we did some stuffed pumpkins last year (find in the new england section), but those were baked instead of boiled. looks to me like any vegetable that can be stuffed, SHOULD be stuffed! That is what I like about this forum - it reminds me of the otherwise obvious things that I am overlooking. Anyway, being a thrifty individual who filled my little Tracker up with pumpkins, I tried a lot of recipes including a simple pumpkin stuffed with regular bread stuffing. This was not bad but a little bland and could stand some serious experimenting next year. Maybe a sweet cornbread stuffing with various dried fruit? I have seen 18th-19th century "Indian pudding" pudding recipes (basically sweet corn mush) boiled in a cloth bag. Now I would like to try an Indian pudding stuffed pumpkin wrapped in cloth and boiled in a cauldron all day. Maybe with dried cranberries, dates, blue berries, etc...(?) I am not sure that I would absolutely need to seal the pumpkin water tight like a chicken/hare jug that you boil but any idea how I might seal a pumpkin for boiling? I picked up a taste for other hard squash when I live in NC and some of them might be good to try for this too. 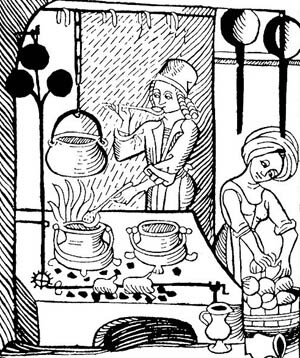 Upon more looking online I see that there are a lot of interesting sounding stuffed pumpkin/squash recipes like: http://www.thekitchn.com/autumn-supper-savory-stuffed-p-99843 Apparently the Dutch and Dutch colonist were famous for full meals cooked separately in a large iron cauldron but I have not found many recipes to support this so far. This gets me just a little closer though. that's a good question, and i must admit i ahve no idea - the only thing that comes to mind is toothpicks. i'm not so sure that it has to be completely sealed - there will be plenty of moisture from inside the pumplin anyway ~ definitely worth experimentation. i forgot to mention - if you like squash, you will love Tök Főzelék!